The Sea Dog Society is open to anyone, all ages, all genders. There are no dues or meetings. 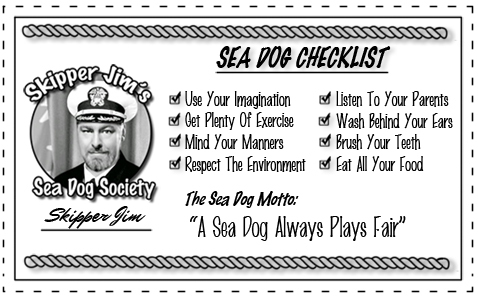 Print out your membership card, keep it with you, and try to follow the path set forth by all the "Sea Dogs" that have come before you. Remember, A "Sea Dog" faces the same challenges in life that everyone else faces, but being a member helps you to maintain a proper compass heading during times of trouble. Combine that with a healthy sense of humour and you will find yourself able to press on through any storm you may encounter. Leonardo DaVinci, WC Fields, Abe Lincoln, Sterling Hayden, Molly Brown, Eleanor Roosevelt, Ben Franklin, Lois Riel, Pierre Trudeau, Amelia Earhart, Babe Ruth, Captain Crunch, David Volansky, John Wayne, Richard Boone, Annie Oakley, Will Wilkins, Alan B. Shepard.....etc, etc.